Snipeshowe was situated on the northern slope of Snipes How, perhaps rather under a quarter of a mile away from the A591. 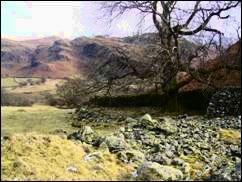 It is a steep section of fell lying behind Honeypot Wood, which is between Brackenrigg and Dale Bottom on the A591. There is now little to see of Snipes How except the foundations of walls and a litter of stones, remaining after the building was demolished in the late 1850’s. It is mentioned in the Indenture of 1623 between the Lord of the Manor of Castlerigg and Derwentwater and some sixty of his Customary Tenants. Here it is spelt Knippeshowe and the tenant at the time was John Jackson. The 1841 census records that Sarah Thompson, a “Washer woman”, aged 70 was living there then and Charles Robinson (Blind Charlie) was born there in June 1844, shortly before his family left and moved to Brigham Row, Keswick where they were living in 1851. Later (by 1861) they had transferred to Brown Beck Cottages. They may have been the last people to live at Snipeshowe, for the building is not mentioned in a church census of 1848, which suggests that it was no longer occupied. The 1840 Tithe map shows that Snipeshowe, along with High Nest and Low Nest, was in the ownership of James Scott, who lived at High Nest at that time. The name is probably nothing to do with the birds! The early spelling of the name as Knippeshowe suggests that the Knipe part is from the Old Norse gnipa, a jutting crag or rocky summit. A Howe likewise, is a name for a mountain, hill, or mound from the Old Norse word haugre. In all probability, the house took its name from the fell on which it was situated. Reputedly, when the vicarage was built at Dale Bottom in 1856, stone was acquired from Snipeshowe, which was abandoned by then. This would explain why so little remains of the structures of house and barns. The land is now amalgamated with Shoulthwaite farm.